This morning it’s already scorching and hundreds of bronzed bodies frolic in the surf. The sea is calm and clear as bathwater, not mosso, with rough waves, like I prefer. Then, I can at least pretend I’m looking at an ocean instead of the sea. I admit, on days like this, I miss the quiet radiance of the Oregon coast. The water may be freezing, but it’s not meant to be a sunbather’s beach–it’s for bikers, joggers, walkers, dreamers and thinkers. There is no baking hot boardwalk filled with carousels and vendors. There is just pure, hypnotic beauty. This entry was posted in America and tagged beach, beauty, boardwalk, ocean, Oregon coast, sea, sunbather, surf, waves. Bookmark the permalink. Mmmm, lovely. And couldn’t agree more…. 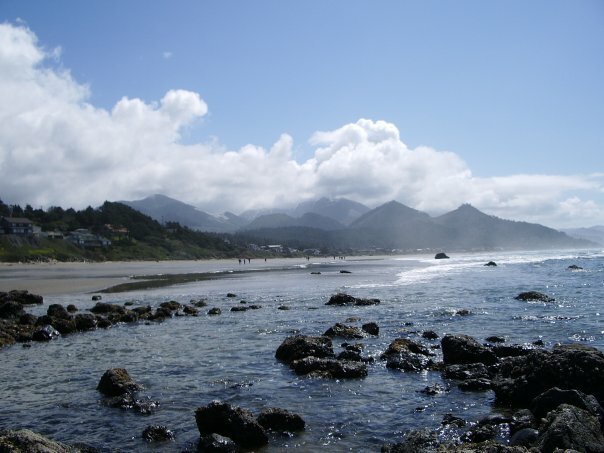 The blog entry about missing the Oregon coast totally resonated with me. The Pacific Northwest beaches are the most beautiful beaches in the world – so much better than the east coach beaches that people flock to all summer. Anyway, wish you all were here. Sounds like you’re enjoying the few remaining months in Italy. See you when you get back.